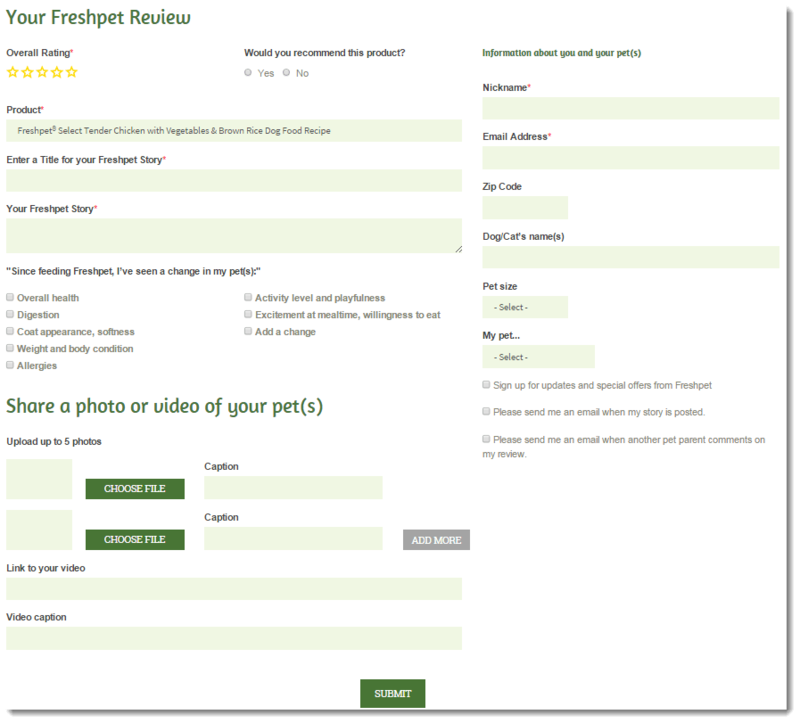 If you’re one of the many pet parents who feed their pets Freshpet foods, we’d love to read about your experiences in our "Freshpet Reviews" page. Your reviews can provide us with invaluable insight on how to keep making the best meals possible for your pets! Whether you’d like to share your family’s Freshpet story, give feedback on our foods, or even share a suggestion for improvement, you can give us your review by following a few simple steps. 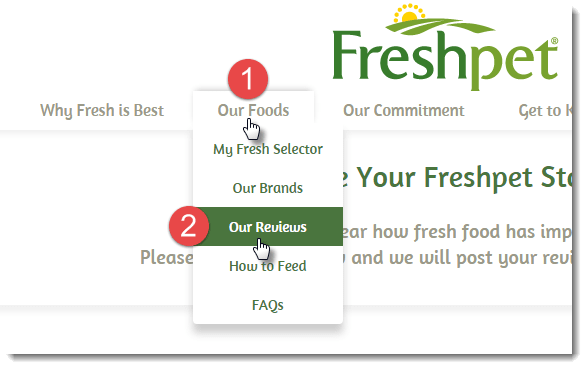 Go to https://freshpet.com/freshpet-reviews/ and click on “Submit a Review” button. Give an overall rating of your Freshpet experience by selecting up to five yellow stars. Right next to the stars, check 'yes' to notify whether you would recommend this product, if you're happy with our products. Select the product you would like to review, and then add your Freshpet story. Don’t forget to choose a title. Fill in the section on changes you’ve noticed in your pet since you started feeding her Freshpet food. Check all the boxes which apply to your situation. Upload up to five of your pet in the next section. Optionally, you can add captions. You may also upload a video by providing a link along with a caption. Fill out your personal details section on the right side. This section includes details about you and your pet including your name, your pet's name, pet's size, zip code and email address. In the same section, you will also see a field marked ‘My Pet’. From the drop down menu, select the option that best describes your pet. At the bottom right hand side of the page, you can select the option to be notified when other pet parents comments on your review. Review the submission form and make sure you have filled out all the sections marked with an asterisk (required). Scroll down, and click on the 'Submit' button and you are done. Congratulations. Your review will be posted in a few days. In the meantime, you can always write another review. Here is an image of what your review will look like once it is published. You can go to the published reviews section by going to the 'Our Foods' menu selection on the home page and clicking on 'Our Reviews'. Your stories and feedback encourage us to do strive to make even better food and treats for dogs and cats. 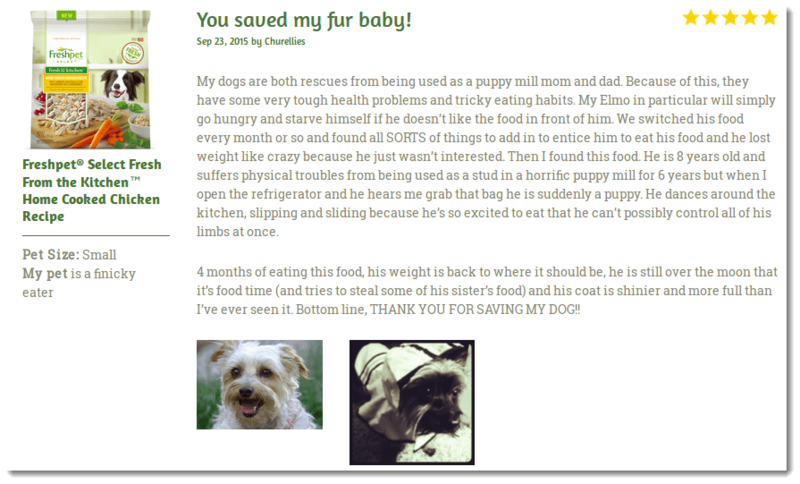 At Freshpet, we love hearing how our food has made a positive difference in pets’ lives. We look forward to hearing about your experiences with Fresh pet!